As kite surfing becomes an increasingly recognised sport, its safety standards are becoming more and more sophisticated, attracting a whole new of breed of thrill seekers to the activity. Kite surfing, or kite boarding, is an activity whereby participants stand strapped to a board and use the force of a large controllable kite to propel them across the water. The art of the sport is being able to control the kite whilst at the same time steering the surfboard. Although surprisingly, it is easier and quicker to learn than windsurfing, it has a harder initial learning curve with the first moves usually proving challenging for the beginner. By its nature, kite surfing is at the mercy of the elements and, as such, can be dangerous because of sudden strong gusts of wind. As a properly regulated sport, kite surfing is still in its infancy but nevertheless its increasing popularity has led to innovations in kite design, safety release systems and training, and meant that the activity is becoming ever safer. However regulated kite surfing becomes it is still a sport that is ruled by the unpredictable elements of the wind and the open sea and so presents high safety risks if not undertaken with the correct equipment, skills and training. It is therefore important that novices begin kite surfing under the tutelage of a British Kite Surfing Association (BKSA) approved school before tackling the elements alone. A beginner can acquire skills such as kite launching, flying and landing and the use of the control bar, lines and safety devices, in a two or three day course, depending on prior abilities with flying kites and surfing disciplines. The safety release system enables the kite surfer to disable the kite at any time. This prevents the wind from taking them where they do not want to go, whether it’s out to sea, up into the air or into the path of an unsuspecting sunbather. The natural reaction in these circumstances would be to let go, so this system stops them from loosing the kite instead. It is therefore crucial to make sure that the quick release system is working before setting out. It also important to check the kite control lines as they will seriously affect the control of the kite if arranged incorrectly. Most accidents occur on shore or when a rider is entering or leaving the water so extra care needs to be taken when launching or landing the kite. Standard practise is not to spend any time on the shore with the kite in the air but instead launch it and leave the beach immediately and then when coming in to land it as quickly as possible. 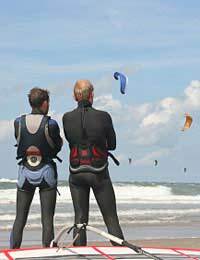 Kite surfing is best practised on quiet open shorelines with a large beach area for launching. The sport is restricted or banned in some locations because heavy beach traffic sparks safety and liability concerns. It is therefore important to adhere to the launch and no launch zones that are designated in certain areas. Nevertheless even in the special launch areas it is safe and courteous to maintain a buffer zone between kite surfer and other people. Always make sure downwind is clear of people, animals and obstacles. Listen to the local weather forecast and pay particular attention to the wind strength and direction and any signs of thunderstorms. Always keep an eye on what the kite is doing as it can change direction quickly and without warning. Avoid kite surfing when the wind is blowing directly shoreward. Always fly within the capabilities of both equipment and experience. Never let go of the control bar unless in an emergency or when packing up, and then only after making sure the downwind is clear. Always have a means of getting back to shore and do not sail out further than you are able to swim back. In a surf zone the out-going kite has right of way. Learners should launch kites downwind from other users.